Very quickly the time arrived for our GB Bouldering team to venture further and cross the Atlantic to compete in Toronto, Canada and then Vail, USA. With a big team representing and oodles of psyche we descended on various airports and made our way first to Hamilton (just outside Toronto). 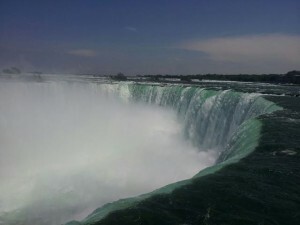 Before the competition we went to see one of the world’s wonders; Niagara Falls. It was quite an experience, very touristy but an incredible natural spectacle. We even went to the bottom on the touristy boat and got soaked! Thanks so much to Keith and Kashca who looked after us and took us to see this awesome sight! The Hamilton World Cup had a great atmosphere; a VERY enthusiastic crowd, good organisation and fun route setting. As a team, we put our best feet forward and managed to get three of us to semi–finals (Leah, Shauna and myself) and one to finals (can you guess who?? 🙂 ). 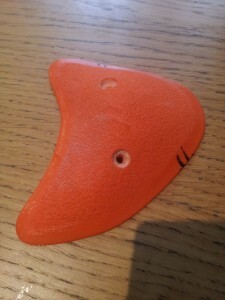 In terms of my climbing I was a bit disappointed…I climbed well in the qualifiers but in the semi-finals I made some glaring route reading errors and lacked some basic strength. All deposited in the bank of experience and logged for future training! On to Vail and we were keen beans. Only four days separated the competitions and we had one day training in Boulder at The Spot (accompanied by pancakes), followed by a short session the next day at the Vail Rock Club. The air is thin in Boulder at approx. 5000ft and even thinner in Vail at approx. 8000ft. We didn’t notice the altitude until we climbed, then it was a case of “why am I so pumped so quickly?” and “why am I breathing so hard after one boulder problem? ?” Having said that, as each session went on we did acclimatise a bit. 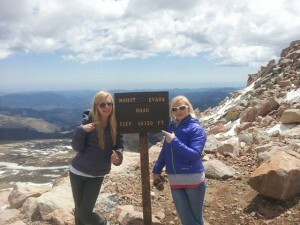 The day before the competition we decided to put our respective haemoglobin cells to the test and we drove up to the top of Mount Evans, a dizzy height of over 14,000ft. Now, up there, even walking was a stress on the system! We had a brief picnic and headed back to register for the competition. Once again, we all rallied and fought our way up as many boulders as possible and this time we had four GB athletes in the semi-finals; joining Leah, Shauna and myself was Dave Barrans. 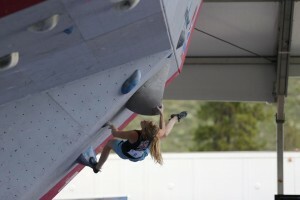 The women’s semi- finals were HARD!! Two bonuses got you into the finals, which was what I had but in too many attempts. The heart breaking moment for me was on the fourth and last problem in the semi-finals. After getting through the crux and setting up to try to finish the problem, I slipped whilst readjusting my hand and fell. 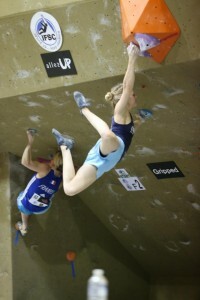 If it weren’t for that slip, I think I could have finished the problem and I would have made my first World Cup Final. I have been close before but this was too close for comfort. What can I say? I slipped and other people didn’t, they were solid on the moves and I wasn’t. Everyone comes out of competitions with the “what if” feeling and I am sure I am not the only one that was close in some way. Bank it and move on. Train harder and look to next year. So, that is my season over. I am not competing in Munich or Eindhoven as I have decided to spend the summer climbing outside and will be cheering on the GB team from glorious Rocklands in South Africa. So 2/3 isn’t too bad. I’ll take it. I was consistent (10th, 12th, 14th, 12th, 9th, 12th,, 11th ) and that is very encouraging. Thanks to everyone for all the support, it makes a huge difference and is really touching to have people behind you. I had a great time and I can’t wait to do it again next year!